Would you like to see my book? Take a peek. Since May, I’ve been working on this. And moving. Exploring. Hunting. (Jobs, that is.) Moving again. Hunting jobs. Again. And writing. Always, always writing. 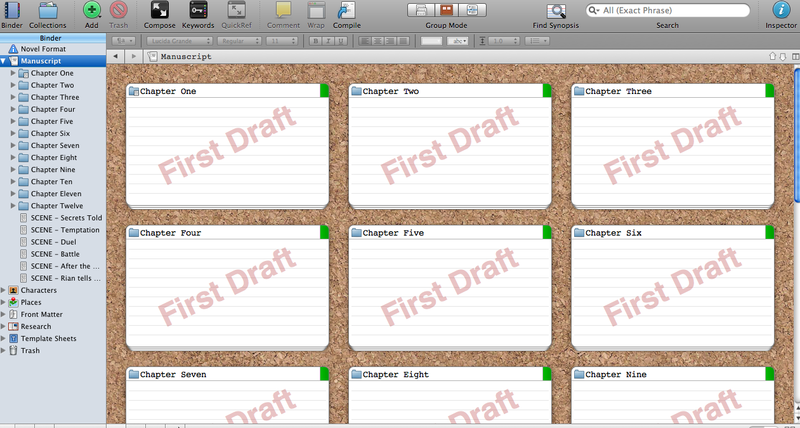 As you can see, I have twelve chapters and several “scenes.” My original outline is divided into 23 chapters. Not sure if I’ll have more or less now. With my first novel, I eventually ran into a wall with how to end it. I just couldn’t find a way to finish it that left me satisfied. And I had far too many characters that I was giving too much time to. With this novel, I was fortunate to have my ending pretty much set in stone. That hasn’t changed. Not at all. What I discovered was that I once I got to chapter eight, I wasn’t sure how to reach the ending. I’m not sure what happens to any of you, but when I have writer’s block, I’m still writing, I’m just writing in circles. I end up writing a lot of scenes with food. I put my characters around a table and make them talk. I’m not sure why. Maybe because I love how awkward people get when there’s conflict but they have to try and play nice. Like family dinners during the holidays. I also write short little conversations that start and end with people walking down hallways. It’s like I get bored with the dialogue, so I make the character walk. With people. Without people, I just tend to fret over my writing. When my friend Jessica visited me in New York, I didn’t touch my novel until her very last day. By that time, I was so psyched to write, I couldn’t help myself and started while she packed. Pretty much everything I handwrite is complete and utter crap. But I get all that crap out on paper so that when I start typing, I can actually salvage something out of it that is halfway decent. Seriously. In the last month I’ve written three scenes that will never be in this novel. Never. I doubted who my characters were, and I wrote three moments that were terribly out of character. The good thing is that doing that helped me understand them better. It helped me figure out who they could become, too. Writing by hand makes everything more tangible. Typing – typing drives me crazy. Once I realize my characters are just walking aimlessly around in my setting and arguing the same issues over and over again, I force them to do something. Usually that something involves weapons. Earlier this week I went to Barnes & Noble. I was there for two hours, and I went with a plan that I was going to wreak havoc on my characters because I was so bored with them. So I started a war. It was so much fun to write. • My villain seems determined to be more of a Snideley Whiplash than – well, who I want. • As always, my biggest fear is that I’m going to make my heroine Bella Swan. • How do we really feel about love triangles? Because my novel has one… Only I keep forgetting the third person in the triangle. I like the character, but I just don’t like forcing the relationship. • Anyone know of any Christian contemporary fiction writers I should check out? Because my novel is now Christian fiction. I was on the fence about that, mostly because I thought I would be limiting my story and my audience. Plus, I judge Christian fiction so harshly, but I made the decision this week that yes, I’m writing Christian fiction. Poll Results: Favorite Heroine [August 6, 2012]. However, I think my character is more like Eowyn than Katniss. With a dash of Jill Pole. This entry was posted in Inspiration, Writing and tagged C.S. Lewis, Eowyn, Jill Pole, Katniss Everdeen, Stephen R. Lawhead, stock characters, the second novel, writing. Bookmark the permalink. I have to respectfully disagree with your friend… I find (and I am not alone in this) Iago to be a problematic antagonist, and probably not a good model if you want something other than a mustache-twister. His primary problem is that his motivation is so vague. Envy? Yeah, some. But really, it seems like he is vindictive for the sake of being vindictive. If you are having trouble with your villain (I’ve been having trouble with mine, too, but it’s getting better), walk right into his or her heart. It can be a scary, scary place, but he or she wants something… wants something or believes something so much that he or she is willing to do ____, ____, and maybe even ____. Remember that your antagonist is a person, even if he is a robot from outer space, and it is in the realization of person-hood-gone-horribly-wrong that, in my opinion, makes a villain effective, distinct and memorable. As for your protagonist, I think that’s a fear all authors have, and rightly (save those who like Mary Sues). Just check her for Sueness now and again and if you have something problematic, tinker. Thank you for the advice! 🙂 I read somewhere that when one is writing a story, the protagonist is the focus and therefore the motivation and changes that occur in the character are part of the story and can be discovered along the way. The antagonist, however, has his/her journey told offscreen, so to speak. His motivation and arc must be real, but they are not always a part of the story. Or rather, they are not the focus of the story. The antagonist is going on a journey, too, but his is largely kept secret from the protagonist. The issue with the love triangle is that I want the two male characters to represent the protagonist’s starting point and ending. And her stakes. I love romances when they’re done well, but I also want this to be an action/adventure/drama thing. I want the romance to be a part of it, but not the sole point of the book. The character in the love triangle I’m having difficulty with is essentially the one I don’t want her to choose, which might be part of the problem. However, I would like to use the character later, especially if I’m successful enough to be able to create the trilogy that I’ve plotted out. Relationship graphs. That’s a great idea. Hmmm… I might email you for more info about this. As for Christian fiction, I wish there were more writers like Lewis, Tolkien, and L’engle today, but unfortunately the Christian fiction market seems to be convinced that you can only write Christian fiction if your characters are a) Amish and b) converted from their evil ways at the end. Um, that’s not realistic. I think it is a great for authors to know much about their characters and worlds that never comes “on screen,” so to speak, for whatever is off-screen bleeds through and makes the rest three-dimensional. As for what to show and what not to show, I think that depends on what kind of story you are telling and how you wish to tell it. Sauron, for instance, needs to be off-screen to play his part, but Gollum needs to be on-screen. Perhaps try writing out some scenes from your antagonist’s perspective and see what he tells you about himself? That might also help decide whether his arc should be foreground or background. I am with you on the theory of the place of romances within stories. That is the kind of story I like, too. Also, I think that “I want the two male characters to represent the protagonist’s starting point and ending” is a promising answer. Writing a scene from the antagonist’s perspective – That’s a good idea. I tried that a few weeks ago, but I just got frustrated and went and did something else. 🙂 With my earlier story, I did that several times, and it really helped understanding the antagonist, but I didn’t know how to fit him in with my protagonist after that. Didn’t know how to fit him in with your protagonist? How so? Ahhh… I thought you made sense. I just wasn’t sure how to include what I was learning about my antagonist. And I realized that the interactions between him and my protagonist were rather passive. In most cases, even, they were not interacting with one another–the consequences of their actions were affecting each other. So it was like writing two stories in one, and I realized I was just making a mess. One of the many reasons why I stopped. I actually just wrote post about a negative side of a trope. I might post it today or in the next couple of days. I want to fine tune it first. It deals with a social issue close to my heart, and I want to make sure I do it justice. I don’t know what you mean exactly by Christian Fiction. Does Flannery O’Connor fit in that category? The Prime of Miss Jean Brodie of Muriel Spark is a wonderful book that can give you ideas for a very evil villain. It’s not exactly contemporary, but it is a great book. Thank you for the suggestions. I’ll look them up. What I mean by Christian fiction is what is currently sold under that label. I know of another writer who was turned away from Christian publishing companies because none of her stories featured the Amish or pioneer women in sweeping romances with beautiful, Godly men. I just can’t write that. Of course, that’s writing what “sells” and not what you want to write. Alas! For that sounds like an interesting mess, to me. I have a wonky sense of narrative, though. I am not sure if anything I ever write will be publishable, though I hope it will be readable.